Asilomar is located in the Central Coast region of California, within the Monterey Bay National Marine Sanctuary. This site is located within the Asilomar State Marine Reserve and Asilomar State Beach. The site is located 1.05 miles southeast of the Point Piños site. This site has been actively managed by California State Parks since 1956 and is subject to regular patrols by Park Rangers. Prior to the acquisition by State Parks the area around Asilomar served as a Young Women's Christian Association (YWCA) retreat and camp. 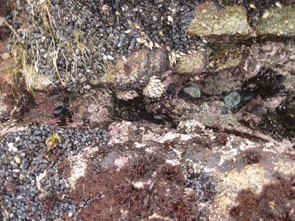 This site receives a low amount of visitation from tidepoolers due to the high level of rugosity present at the site. The site is steeply sloped in most areas and consists of extremely uneven terrain. The site has several large and deep fractures running parallel to the shoreline that separate areas of raised continuous outcroppings. Overall the site has many cracks and folds throughout the area. Asilomar is dominated by consolidated granite outcroppings. The primary coastal orientation of this site is west. Long-Term Monitoring Surveys at Asilomar were established in 2012 and are done by University of California Santa Cruz. Biodiversity Surveys were done by University of California Santa Cruz in 2012 in partnership with California State Parks and Asilomar State Beach. The Biodiversity Survey grid encompasses one section that is approximately 40 meters (along shore) x 20 meters (seaward). Click here to view Biodiversity Survey findings at this site. For more information about Asilomar, please contact the Asilomar State Beach Environmental Scientist at 831-646-6444.